One question we get asked all the time as photographers is “what should I wear?” – outfits can really make or break the overall outcome of your final images! Determining the overall sense of style you want for your engagement photos beforehand will make you much happier with the end result. The goal here is to choose outfits that make you and your fiance both feel COMFORTABLE and CONFIDENT. Below are our top tips on choosing great outfits for your engagement session. 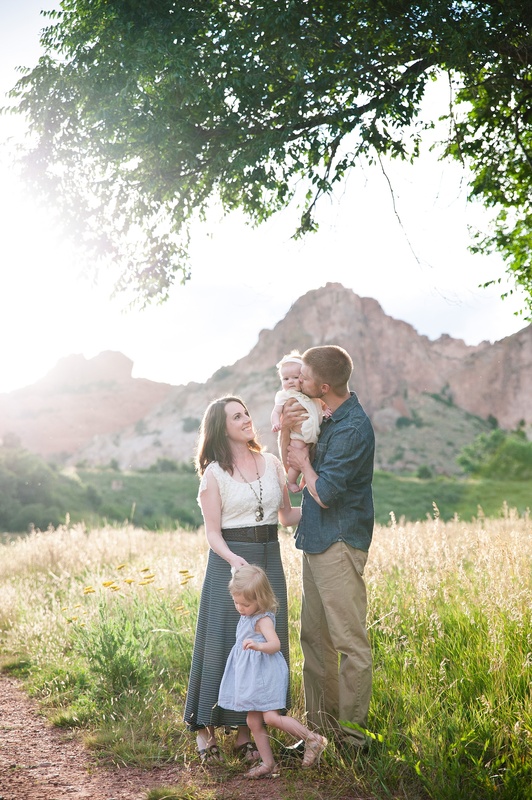 We also encourage you to read our “5 Tips for Your Engagement Session” to help you know what to expect for your session. Enjoy! 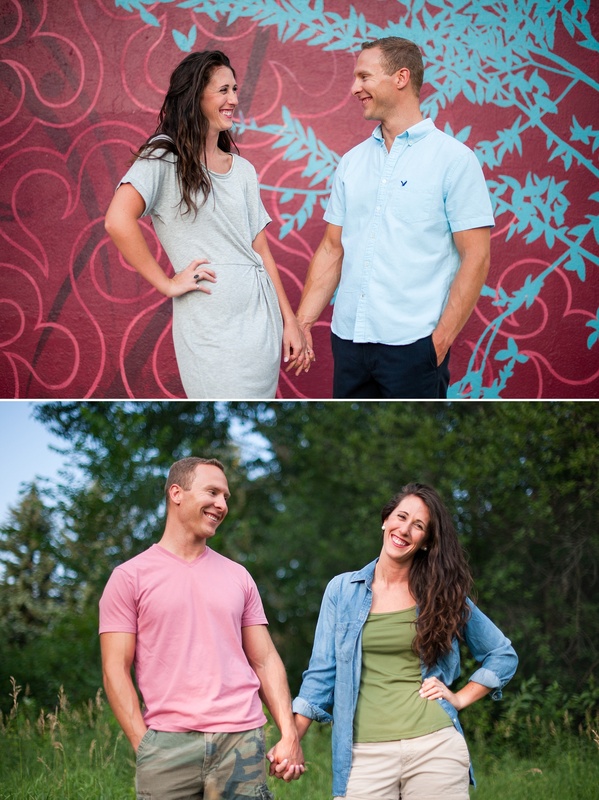 Most couples choose to bring two outfits for their engagement session; one is typically on the dressier side and the other is more casual and relaxed. We suggest beginning in the more “formal” outfits then changing to the casual outfits after you get more comfortable behind the camera. 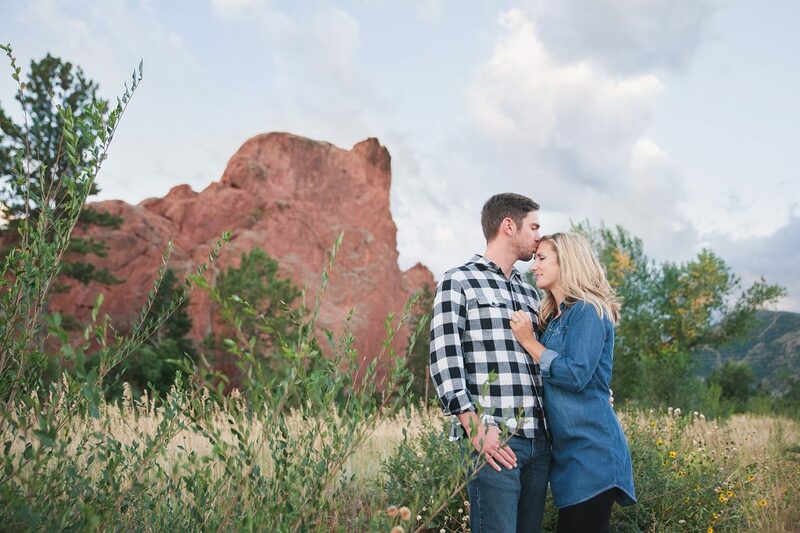 Molly and Kyle decided to wear their dressier outfits for the part of our session in downtown Colorado Springs, and then changed into more casual outfits when we went to Rock Ledge Ranch. I love their style (and they are just SO cute!)! Coordinating doesn’t mean “matching”! Don’t feel like you have to wear the exact same blue, wearing the same color in a different shade is actually more ideal than trying to match. So yes, this obviously is not an engaged couple but I HAD to show you this image because this family seriously had the best coordinated outfits ever! I love the combination of blues and neutrals throughout their outfits, it’s simply perfect! SIMPLE is best! Stick to solids and simple patterns (no pictures, logos, words) and add layers and accessories. When it comes to patterns, it’s better to choose a bigger pattern (like a big plaid) rather than a teeny, tiny pattern (like a little checkered shirt) since these don’t photograph as well (the camera actually has a hard time picking up tiny, detailed patterns in clothing!). 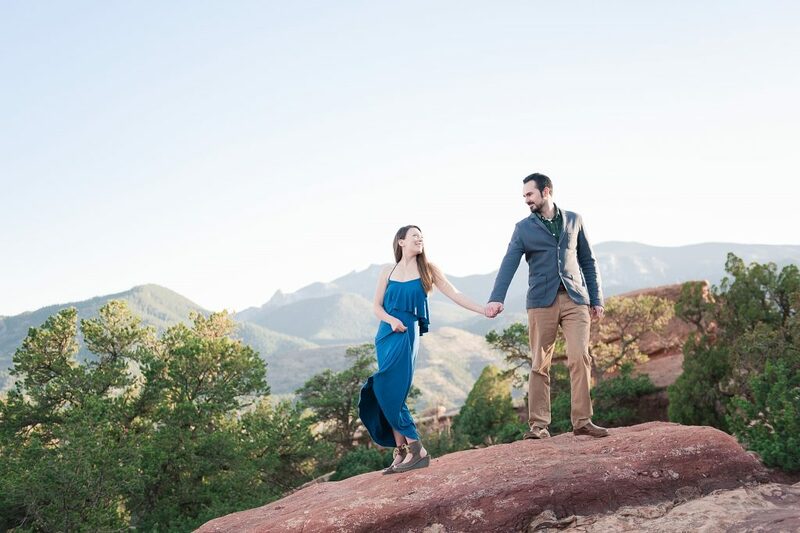 Rachel and Ryan choose simple yet perfectly suited outfits for their engagement session at Red Rock Canyon open space. By wearing solid colors and simple patterns their clothing choices didn’t clash with the gorgeous scenery, but instead helped them stand out. Accessorize and layer! This looks great for photos; open jackets, vests, cardigans, scarves, big necklaces, etc. It can be fun to add one bold pop of color (so helpful in winter) or pattern. If one person is wearing a lot of color or bold pattern, just make sure the other person is in something neutral to balance your outfits. It was January when we did this session so it was just a little cold out. Amy and Jared did an excellent job of adding cozy accessories to their outfits, plus the texture on Amy’s sweater adds so much to the overall feel of the image! Consider if you’d like to choose outfits that will coordinate with your wedding colors. This isn’t something every couple does but it can be a fun idea. Also keep in mind that if you want to hang any prints in your house, it’s smart to make sure your clothing doesn’t clash with your interior decor. Megan and Andrew were planning a fall themed wedding with purple and gold as their main colors. 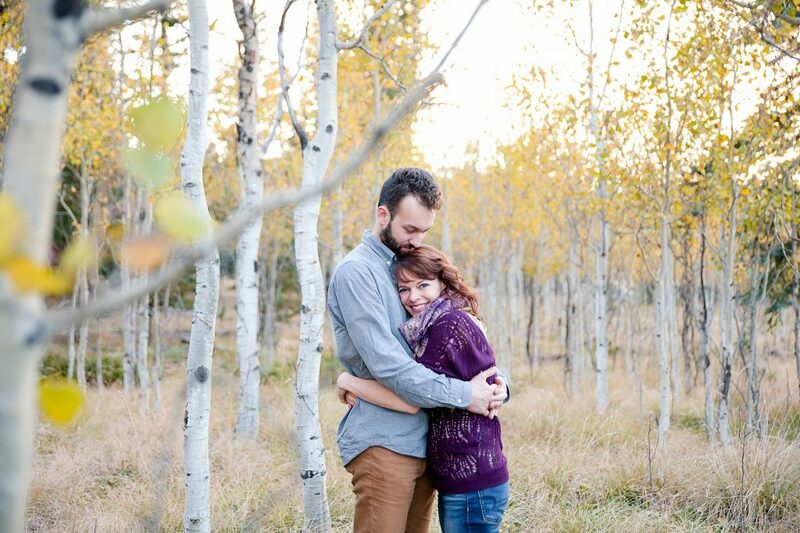 We did their engagement session up in Woodland Park, CO right when the aspen trees were turning golden yellow! Megan wore a plum colored sweater and it couldn’t have coordinated more perfectly with their wedding colors. Make sure your outfits are “equal” – meaning if the bride-to-be is wearing a nice dress, don’t have the guy in shorts and a T-shirt! 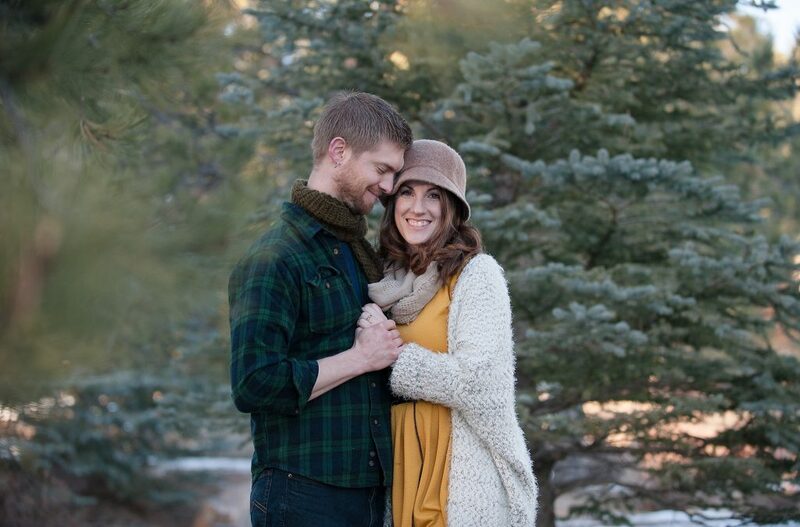 I adore what Nicole and Taylor wore for their engagement session! Taylor’s suit was the perfect compliment to Nicole’s gorgeous blue top and fancy skirt. 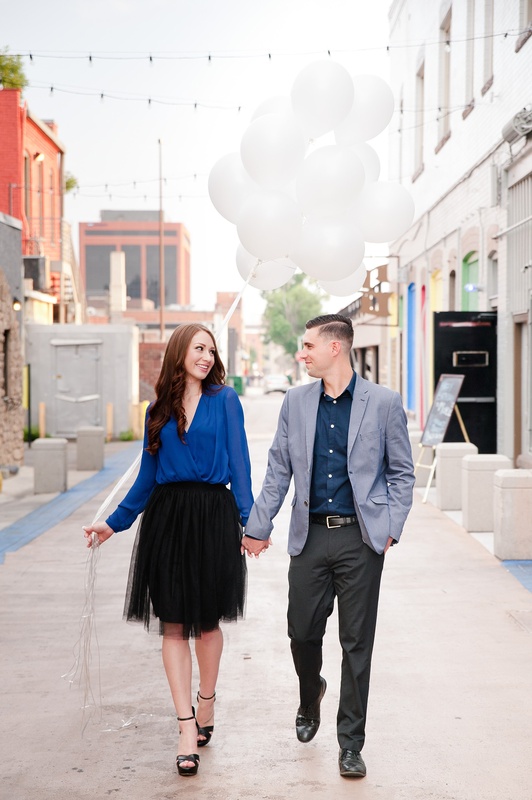 I love that their outfits also matched the city background they choose for their session. Pay attention to shoes (we may have had one or two guys show up in a nice shirt and pants and grungy tennis shoes!! )…Wear solid colored shoes if possible (multi-colored shoes draw a lot of attention). Not only did Harmony and Patrick look cute in their black and white clothing choices, their shoes complimented their outfits perfectly. Guys can dress up any pair of jeans with some nice shoes! Lastly, choose clothing that is FLATTERING on you! Everybody has a color or a cut of clothing that looks great on them, as well as colors and styles that do not flatter their skin-tone or figure. Most of us have some part of our body that we’re a little self-conscious about, so if it’s your arms, don’t wear a strapless dress or sleeveless shirt! If it’s your legs, don’t wear a mini-skirt. 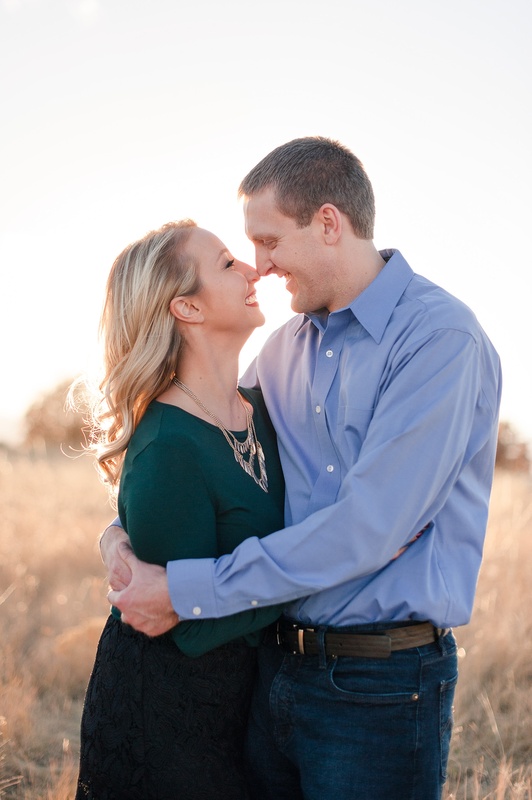 If you never wear yellow it’s probably not a good idea to wear a yellow shirt for your engagement session. Overall, you want to be in something that you feel confident wearing. For some reason (maybe it’s because we usually do sessions in the warmer weather), ladies can be a little hesitant to wear long sleeves for their engagement session. I love the long-sleeved top Angela chose here – add that gold necklace and she looks so elegant and stylish in Jon’s arms! We hope these tips are helpful as you choose your outfits – we can’t wait to see what you and your fiance come up with!